Fall is here. Soon we'll have little monsters knocking on doors, looking for sweets. In this newsletter, we will talk about CANDY, trick-or-treating, and give you some information about dental insurance before the end of the year. We hope you find the content useful, and as always, if you have suggestions for topics you think might be interesting, please reply as a comment to this blog post. Thank you again for your time. And keep smiling! 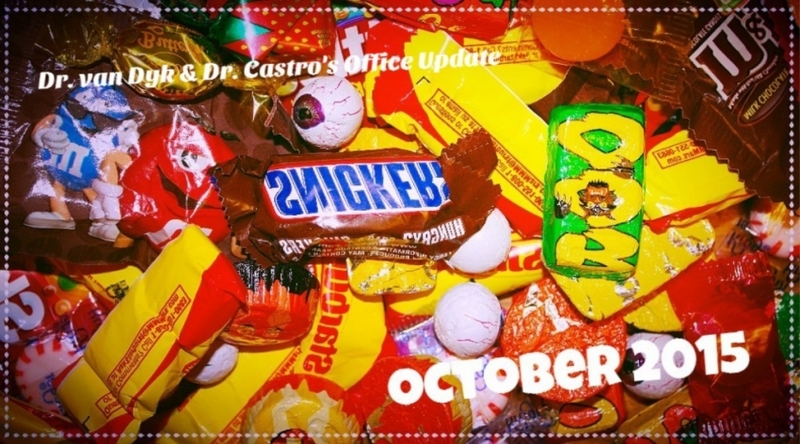 Our staff shares what their favorite (& least favorite) candies are. Luz: "Sorry everybody, but I don't like Tootsie Rolls--they don't have much taste and the texture is weird. I love Reese's Pieces because they're delicious and buttery in your mouth." Dr. Castro: "My favorite candy is toothpaste. I don't like gummy bears." Marlene: "I love M&M's because you can eat them by the handful. I don't like chocolate-covered cherries because I'd rather have the two separate." Ayako: "My least favorite candies are caramel apple suckers because they break teeth. My favorite candy is anything chocolate--who doesn't like chocolate?" Wendy: "I actually have two favorite candies: Jolly Ranchers & Almond Joys. I also have two least favorites: Tootsie Rolls & Reese's Pieces." Lily: "I love dark chocolate because it's so rich and full of flavor. I don't like white chocolate because it tastes too much like milk. Ew!" Starr: "I really like peanut M&M's because peanuts and chocolate are a good combo. I don't like candy corn because they look unappetizing." Gina: "I love Kit Kats because they're light and crunchy. I'm not a big fan of Nerds...they leave a lot left to be desired." Dr. van Dyk: "My favorite is the See's chocolate piece with the maple nut inside. Someone always eats it before I get it, though. My least favorite is cotton candy because it's like there's nothing there." We'll share the results in our next newsletter! scary ghosts or spooky buddhas? A safe, fun, and healthy event for kids. On Thursday, October 29, from 4pm-5:30pm the City of San Pablo will be hosting "CITY HALL-O-WEEN", a fun event for kids to trick-or-treat in San Pablo City Hall. Our dental office will have its own booth with fun games for kids. Because the City of San Pablo has a Healthy Families Initiative, instead of candy, we will be giving away toothbrushes to all the lucky trick-or-treaters that come by our booth. Be sure to bring your own bag! Getting the most out of your insurance. Important information to know before the end of the year. In our last newsletter, we talked about the difficulty getting patients to accept the need for dental care when there is seldom any pain involved. In ffact, our efforts to provide care are based on catching problems before they become painful (and complicated). This time I'd like to explain what may seem like a very self-serving effort on our part. Many of our family of patients are lucky enough to have dental insurance that helps to cover some of the cost of dental care. Some of our patients have need for preventive and restorative care but put off having it done. For those with insurance, this can mean leaving coverage on the table. Unlike medical insurance, dental insurance offers a maximum amount per year that disappears if not used. So at this time of year, we take the opportunity to review your treatment needs and check in with you if have dental benefits remaining. Hopefully everyone looks at this as a service to our patients. As we like to remind everyone, our family of patients are always in charge of their care based on the many variables that contribute to their lives. One of our jobs is to help you in making the decision easier.